I have Pinterest to thank for leading me to this very simple, but very good science experiment for us. We have three children in our home. One of them is still in diapers. One of the other two must constantly be asked if they washed their hands. If the answer is yes, then we must next clarify that soap must be used. With that child in mind (though everyone could benefit), we had our first summer science lesson. After children play outside and before they wash their hands, have them handle an apple slice "all over." After the children have all handled it, place it in a jar. 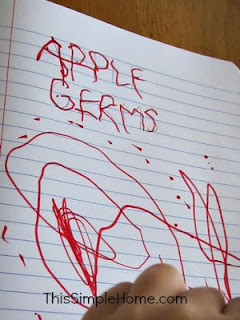 Have the children wash their hands and then show them the other apple slice and allow them to handle it with clean hands. Place that in the other jar. Ask for suggestions as to how the jars should be labeled. Then have the children make predictions as to what will happen to the apples in each of the jars. When mold begins to grow (or decomposition is well under way) place the jars in a prominent spot. (Our kitchen counter was ideal.) Have the kids makes observations and even smell the two apple jars. Lead them to conclude why one set of apples became moldy and was much more rotten than the other. We followed up our discussion by writing in our summer journals. They told me the title. I wrote it for Brother for him to trace and Big Sister used his for spelling. Below his picture, Brother had me write a sentence about washing our hands for the conclusion. 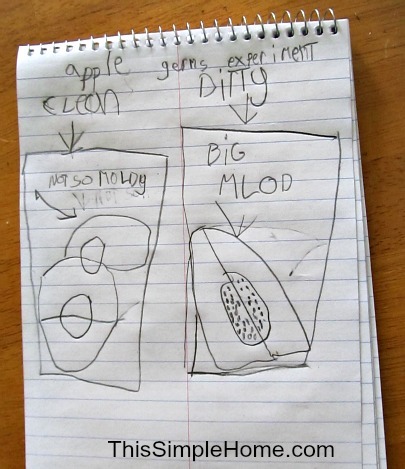 Eventually Brother copied Big Sister's drawings and made two jars with apples inside. When we were done, I had the children dispose of the apples by dumping the contents of the jars into a zippered bag. Beware! Decomposed apples are juicy!! Interested in more science? Check out our lemon experiments, cold weather science experiment, or our science Pinterest boards. Shameful confession: I totally messed up this experiment. I also did something that no scientist should do. I made the results meet my conclusions by changing the lids when I saw the "clean" apple was totally rotted and moldy and the other really wasn't too bad. I made the mistake of cutting TWO apples. (These apples were not in the best of shape, and obviously one was pretty close to rotten already.) 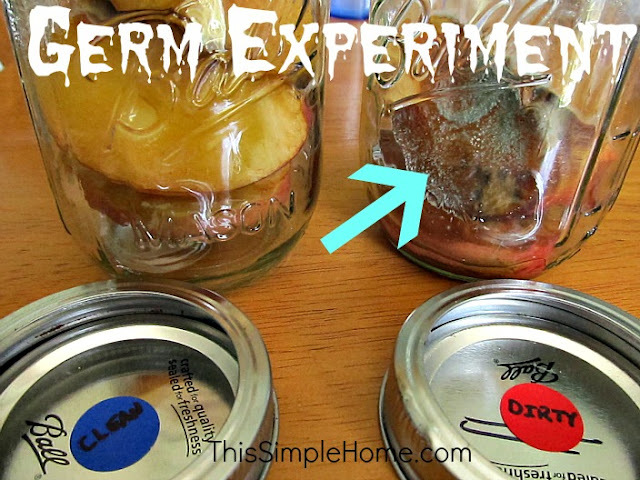 If you do this experiment, use apple slices from the same apple! If my children both washed their hands regularly without complaining, I likely would have led the experiment down the road of "Why did that happen?" However, with the goal I had in mind, I opted not to do that and switched the lids instead. I'm going to link this to Science Sunday at Adventures in Mommydom! Very funny true confession! Sometimes you just can't count on science to make your point :) But, it looks like a fun experiment, anyway. Ha ha ha ha, I had to laugh at your shameful confession. I haven't had to do that yet, but I've been tempted to. I love the ABCD of drawing, I am SOOOOO stealing that! Your shameful confession is hilarious! ;D Great idea, though! I'll have to pin this one for a little bit down the road.